Ann Cleeves on writing the Shetland series. Wild Fire is the eighth and final book in Ann Cleeves’ hugely popular Shetland series which has been adapted into the BBC One television series starring Douglas Henshall. Watch the trailer for series five below. We talked to Ann about what it was like seeing her stories come to life on screen, how she developed the series and why she felt the time was right for the final Shetland instalment. Why did you decide to set the series in the Shetland Isles, and what do you think is the appeal of crime stories set in close-knit communities? I first went to Shetland more than 40 years ago after I dropped out of university and I fell in love with the islands. I've always enjoyed traditional detective stories, but Shetland also has the atmosphere and space of Nordic novels, so it gives me the best of both worlds: an enclosed community where everyone knows each other and the kind of bleak beauty that provides a chilling backdrop. In close-knit communities, any tragedy hurts everyone, because there's always a personal connection. A reviewer once said that I write Village Noir. I like that description. 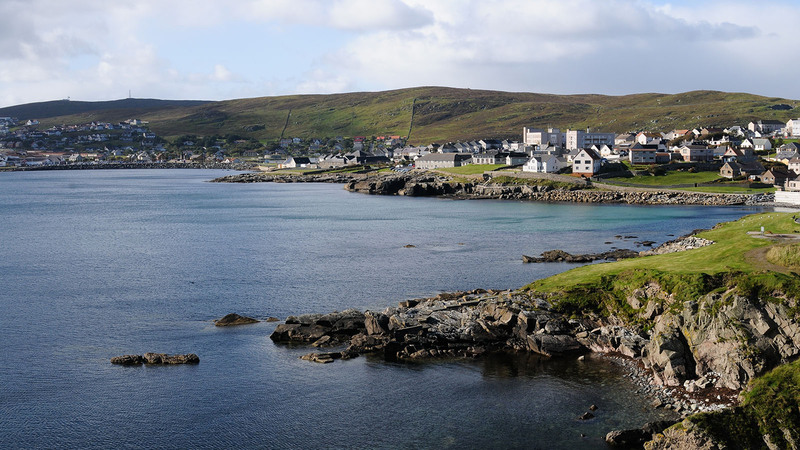 When you began writing the first Shetland book, did you envisage it becoming a series? If so, how did you see the characters developing and did this change as the series progressed? When I first started writing Raven Black I thought it would be a stand-alone book. My editor and I had decided it would stretch credibility to have more than one series of murders in a place as small as Shetland. There are only 23,000 people in all the islands. But the book was more successful than anything else I'd written and readers seemed to love the Shetland background, so we thought it would run to a short series. First, there was going to be one quartet and then two. In regards to the characters, Jimmy Perez develops because there are tragedies in his life. His former wife says that he's 'emotionally incontinent'. Perhaps he gives too much sympathy and compassion to his colleagues, to the victims and even to the offenders. He doesn't have much kindness left for the people close to him. By the end of the series I hope his priorities have slightly changed. Is there a character that you particularly loved writing? I enjoyed writing all of the characters, not just the main police protagonists but also the Shetlanders who appear in individual books. Magnus, the old man, who is one of the suspects in Raven Black is a particular favourite. He's partly based on an elderly crofter I knew in Fair Isle and I feel very sorry about his loneliness in the novel, the way he's the object of such unkindness. He gets a mention again in Cold Earth and we know that he's had a happier life. Sandy Wilson, Perez's junior colleague, is a character who develops a lot over the eight books. He starts off as pretty incompetent and very insensitive, but he grows up over time. He comes from the island of Whalsay and Red Bones was written and set there to give him more depth, more of a back story. The Whalsay Islanders weren't very happy with the initial portrayal, but I invited them all to the launch of Red Bones and I got a good response to the story. One of my favourite characters in the TV drama is 'Tosh' and she doesn't appear in the books at all. I wish that I'd written her though! How did you find the experience of seeing your series adapted for television? Was there a particular story that you loved seeing come to life on screen? I watch the TV show like any other viewer. Sometimes I'm shown the scripts or the DVDs in advance and I love going along to the read-throughs to meet the stars and the guest actors, but really I like coming fresh to the finished drama. The books and the shows are very different formats. I've been very fortunate though. The writers and directors and the actors have captured the essence of the books and the characters, even though they change the details of plot. The story that I loved most was one of the original stories, not an adaptation of the novels. It was series three, the first six-parter. It explores the sexual assault of one of the main characters, and is very sensitively written by Gaby Chiappe and beautifully acted by Dougie Henshall and Alison O'Donnell. Why did you decide that Wild Fire would be the final Shetland book? I thought after the first quartet that I still had things to say and ideas to explore about Shetland. The islands were changing; oil was running out and the oil revenue held on deposit was earning a lot less interest after the financial crash. There seemed to be a less settled and optimistic atmosphere to the place. At that point I decided to write the second quartet that was less about individuals and families and more about community. The first quartet has titles containing colours and titles of the second contain elements. I want to stop writing about Shetland while I'm still passionate about the place and the characters. I can't think of anything worse than writing a book when that passion is over. Much better to finish a series when I and the readers still want more.